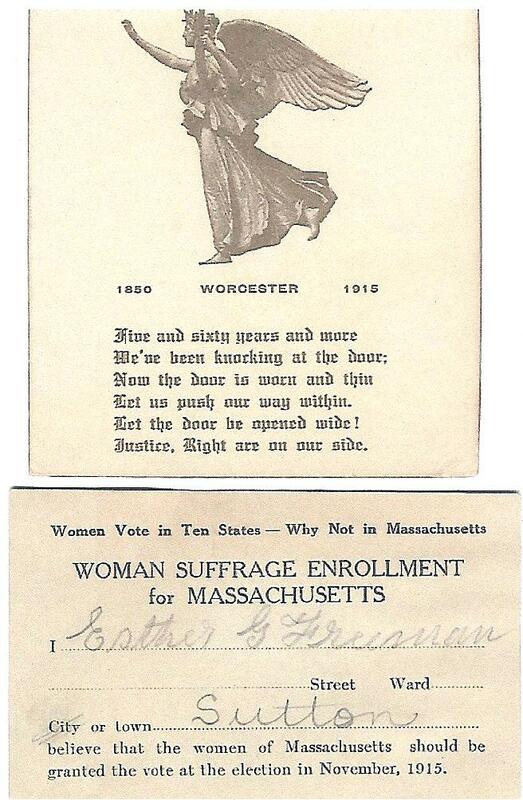 The purpose of this resource page is to offer the resources found while “fleshing out” Lucy Waters Phelps and other Massachusetts’ suffragists to students and other researchers. They provide a starting point and often generate as many questions as they answer. The tin bluebird signs, shown above, were hung on the front pillars of Phelps’ home according to historian Paul Brosnihan. 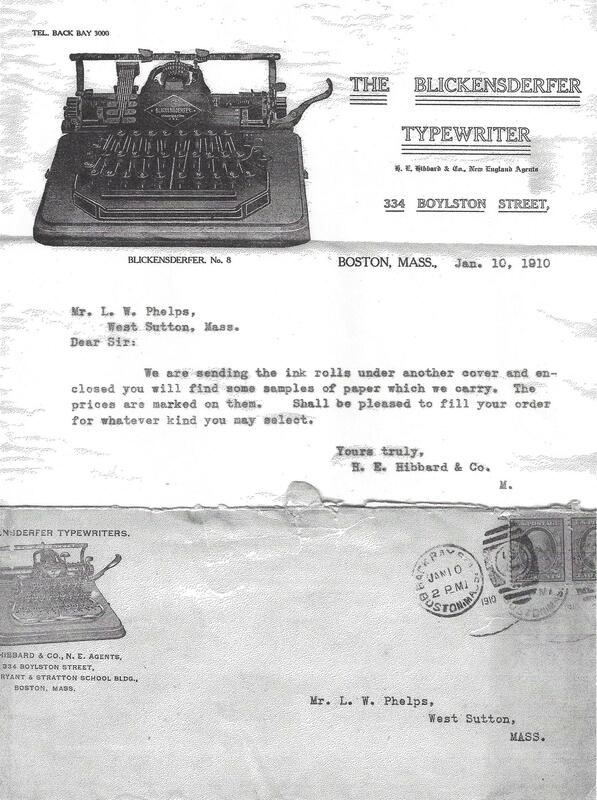 1898 January 6 Massachusetts Women’s Bimetallic Club membership notification from Edith Peters to Lucy Waters Phelps. Phelps Family Archives. 1919 Lucy on state committee on Massachusetts Single Tax League. Land & Freedom, Vol. 18-19 of Single Tax Review (113). Phelps Family Archives. 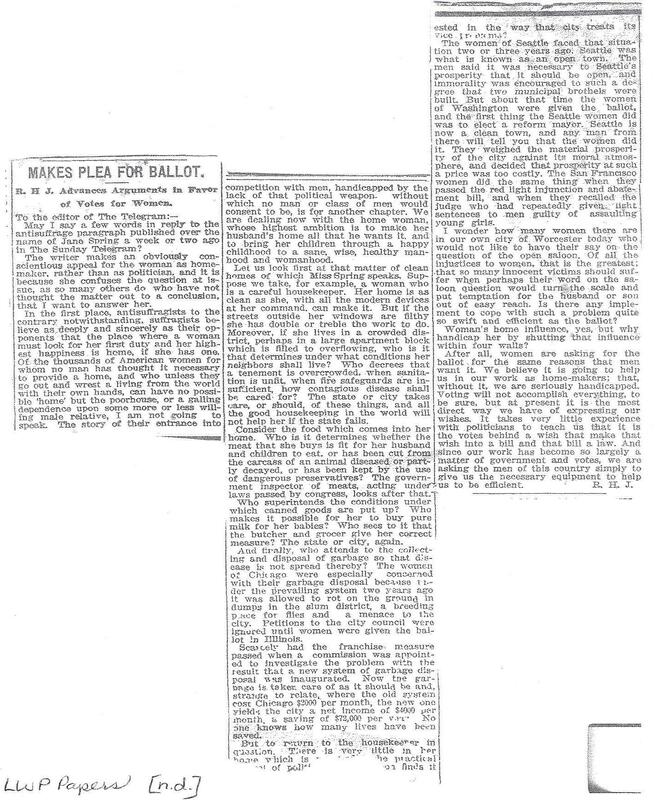 Phelps Timeline Note that Lucy’s 1900 voter registration drive was to defeat an unpopular school committee member’s election. “Yours for Right, in Action as in Thought…” 2004 Fall WWHP Newsletter (6 & 7). 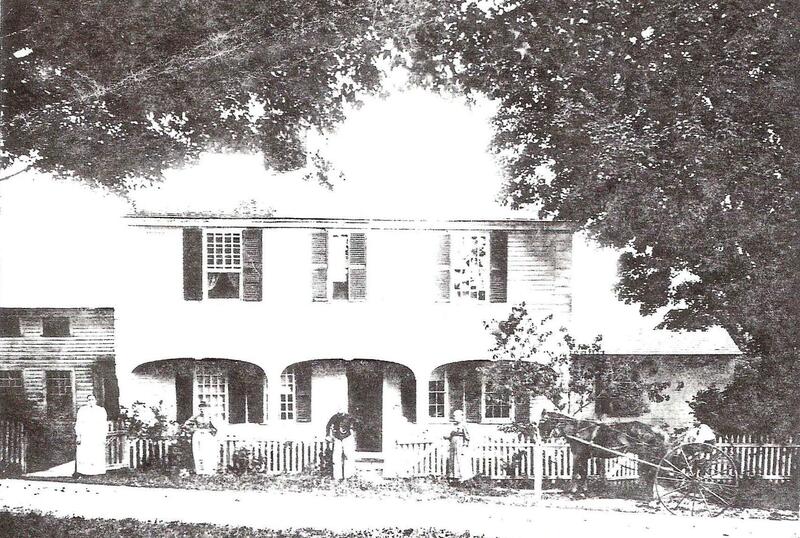 Phelp’s West Sutton home (Howe, late 1880s). Stevenson Collection. 1920s view of 646 Central Turnpike, Phelps Family Archives.
. View of Lucy’s autograph and stenciling in her bedroom (Board Moran, 2003). 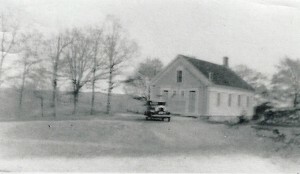 Back view of 646 Central Turnpike [n.d.], Phelps Family Archives. 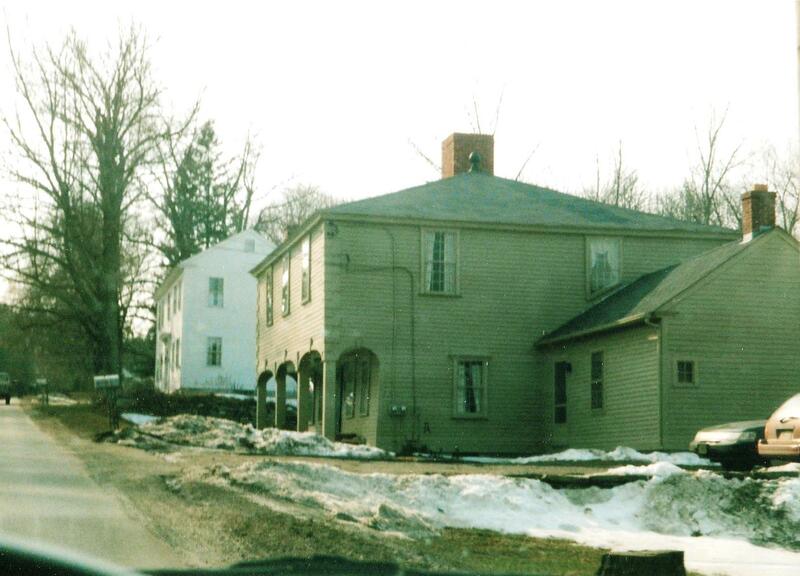 Phelps’ homestead 650 Central Turnpike, Sutton showing road buildup over time (Board Moran, 2003). 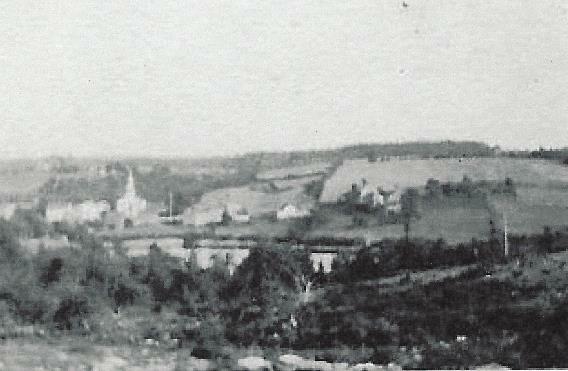 1920s view of West Sutton, Phelps Family Archives. The West Sutton Historic District is on the National Register of Historic Places. Lucy Waters Phelps never owned a car. She used the trolley to travel to Worcester and connect to the railways. The system’s hub was Harrington Corner at the junction of Main, Front and pleasant Streets in downtown Worcester. 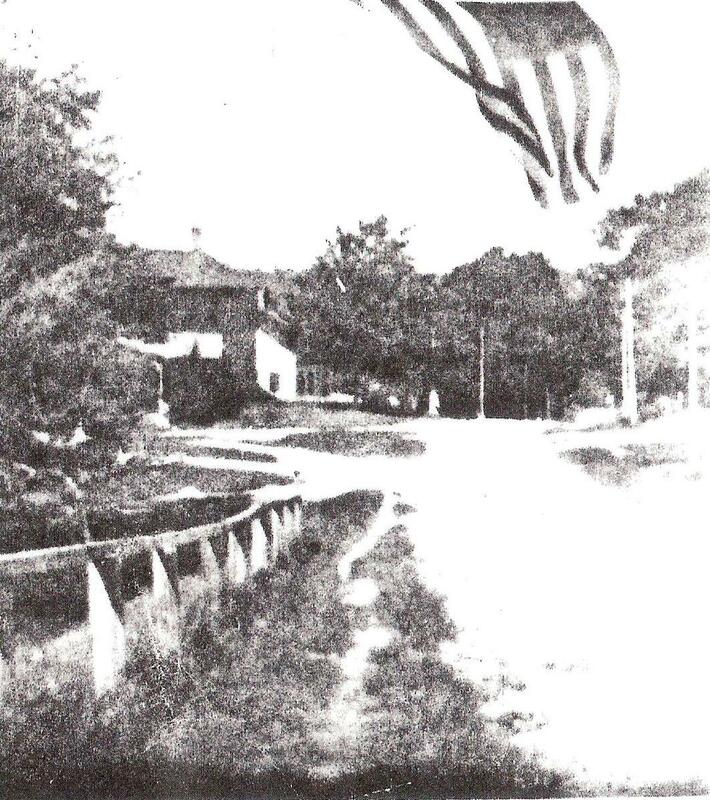 The Worcester & Millbury line began in 1892 and the Uxbridge & Blackstone Valley line in 1901. By 1911, all of the suburban lines had been merged into the Worcester Consolidated. 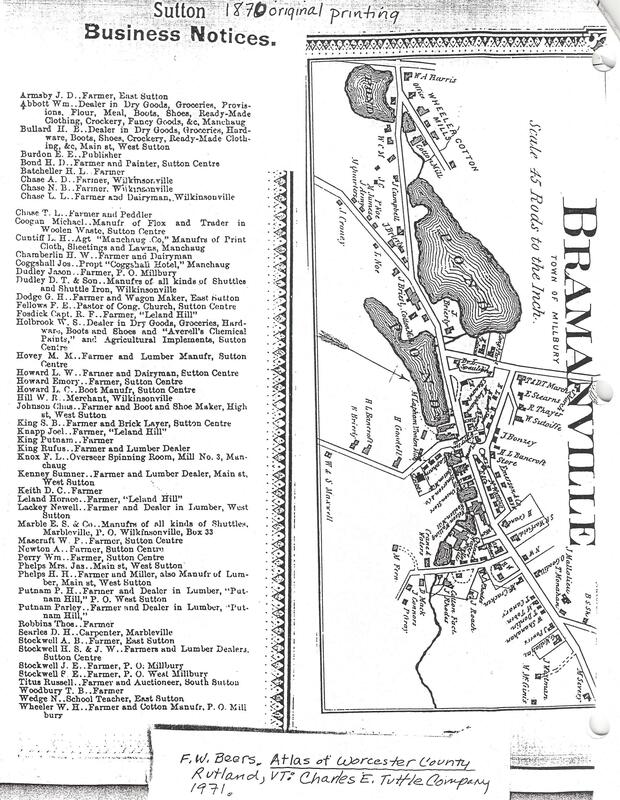 Routes as of 1922, traveled from Jefferson & Bramanville (Millbury), Blackstone Valley–Woonsocket to Providence and Plummer’s Corner to Whitinsville. The Millbury line was abandoned in 1929 and was replaced by private and jitney bus lines. For more information see: Philip C. Becker’s “Worcester Consolidated Street Railway” and Carlson and Harding’s Worcester Trolleys Remembered (Worcester Regional Transit Authority, 1985). Shall stand ‘mong great ones of mankind. Excerpt from Phelps’ “A Child’s Possessions” printed in The Coming Nation, August 1900. 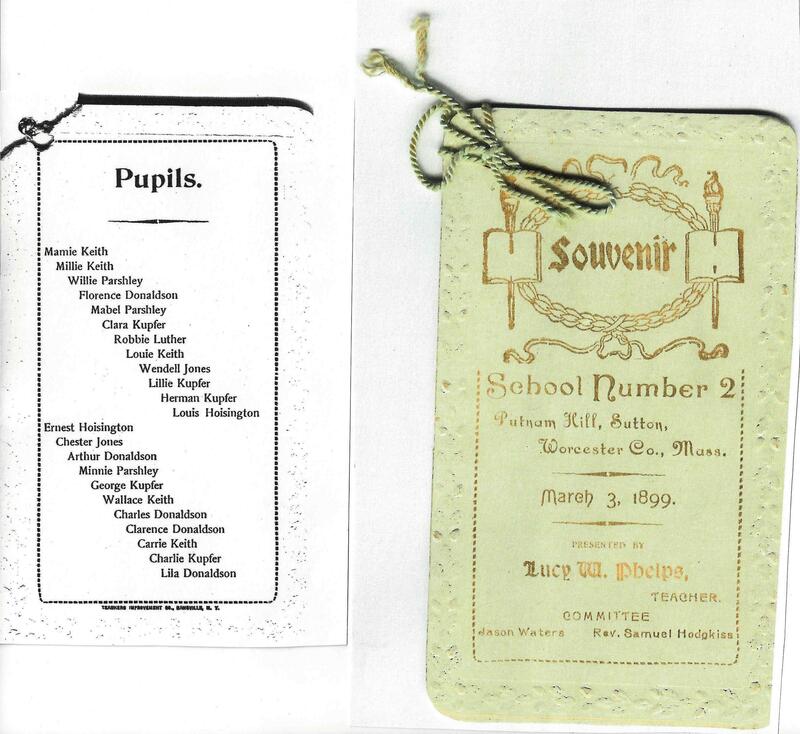 In the Report of the School Committee of the Town of Sutton for the year ending April 1, 1884 (East Douglas, MA: Charles J. Batcheller, 1884) we find the first time Lucy is reported with perfect attendance (her brother Charles was frequently listed prior to this date). She would have been 7 years old in the spring (aka summer) term. Her teacher, Miss Mildred Sibley, reported over the 2.5 month term 31 scholars had an average attendance of 25.31. Miss Sibley earned $28 per month. Lucy continued to have perfect attendance for the 3rd term of 1888 despite the interruption in school due to an outbreak of scarlet fever and measles. 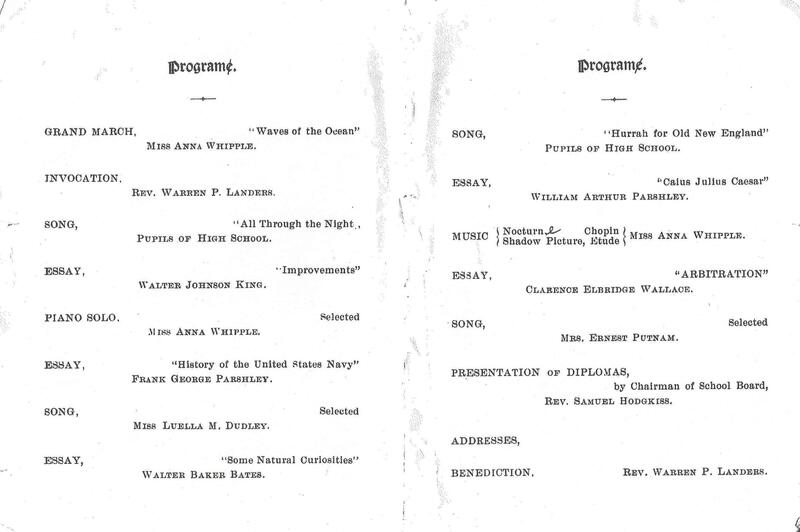 The first two terms in 1889 she did it again with M. S. Bixby as her teacher through 1890. 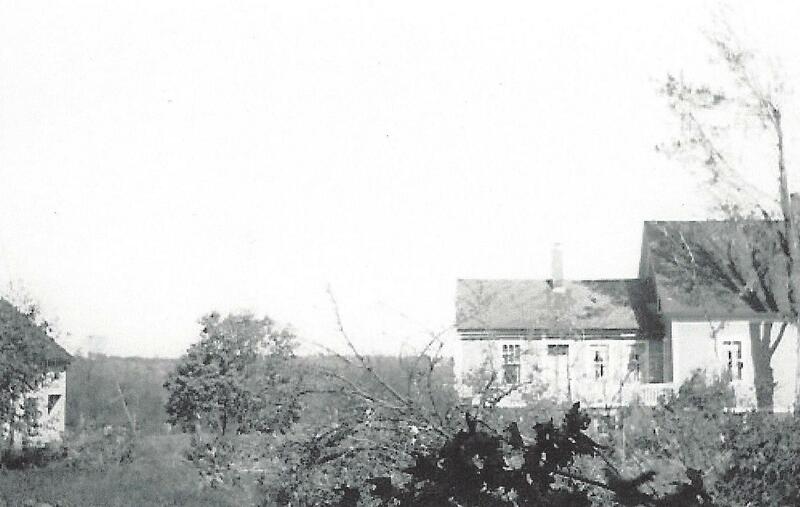 The 1890 Report said the West Sutton school house was moved for $200 onto land that cost $50 with a “good play ground and warm dry basement”. The plan was to replace seats and desks. 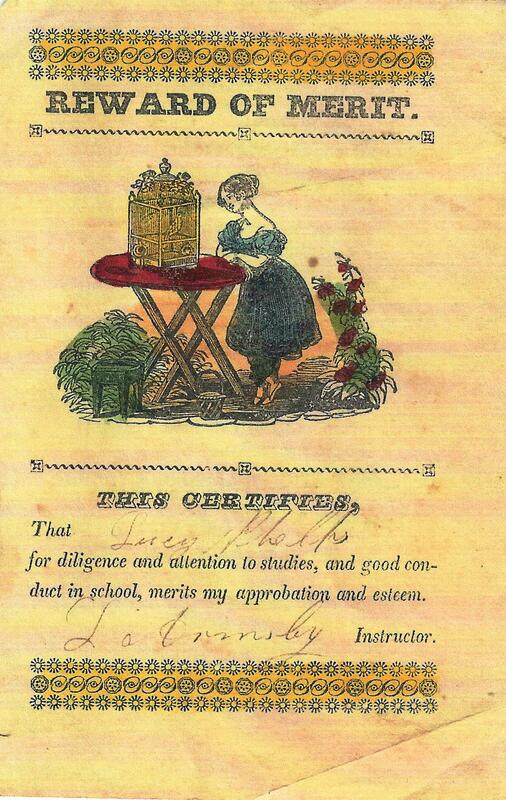 Did 15 year old Lucy go away to school after having perfect attendance during second term of 1892? Or did she go to Sutton High School? Evidence of her first teaching assignment was the 1895 Report said Miss Phelps taught at Harback school 1894-5 and paid $225 for 7.5 months with 32 students (27 average attendance). She was paid $48 January 1, 1895 for teaching in District 13 (Torreyville) to replace Seddie Hodgdon; $8 for Wilkinsonville Primary on February 8 in District 8 (along with her uncle Jason Waters. She was also paid $4 to care for West Sutton school June 9 and November 23. Her brother Willie was paid $2 February 7. Lucy taught in West Sutton for 12 weeks in February of 1996 and then was at Harback with Miss Bessie M. Kimball (June and September, 1896 and February 1897). Lucy was paid for 9 months with 24 students: Spring Term March 28-June 17, Fall Term August 29- November 18 and Winter Term December 5 for 13 weeks including a week of vacation. Joe Moore, Carrie Shaw (visiting), Addie Harback, Clarence Wallace, Ann Tucker, Everett Plummer, Sarah Limure [? 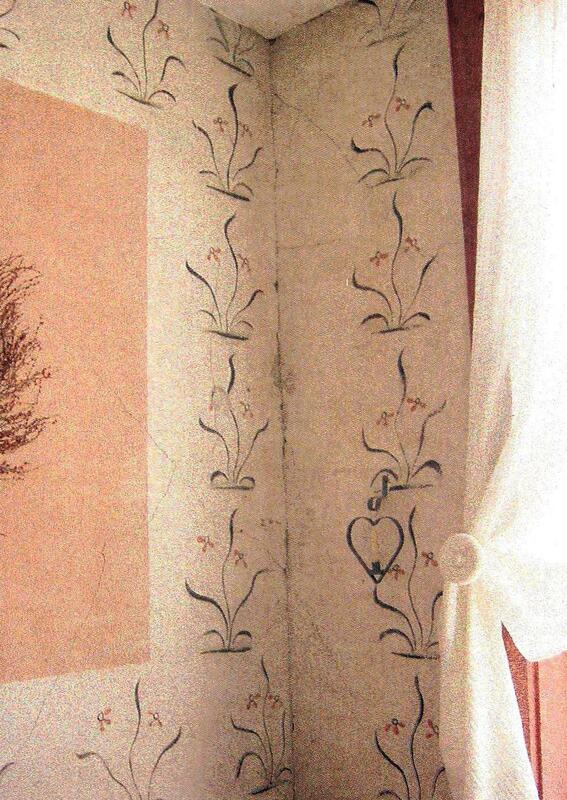 ], [Enfletie ?] Waters, Charles Plummer, Louise Putnam, Lucy W. Phelps (teacher). Noted that several students were absent. Phelps Family Archives. 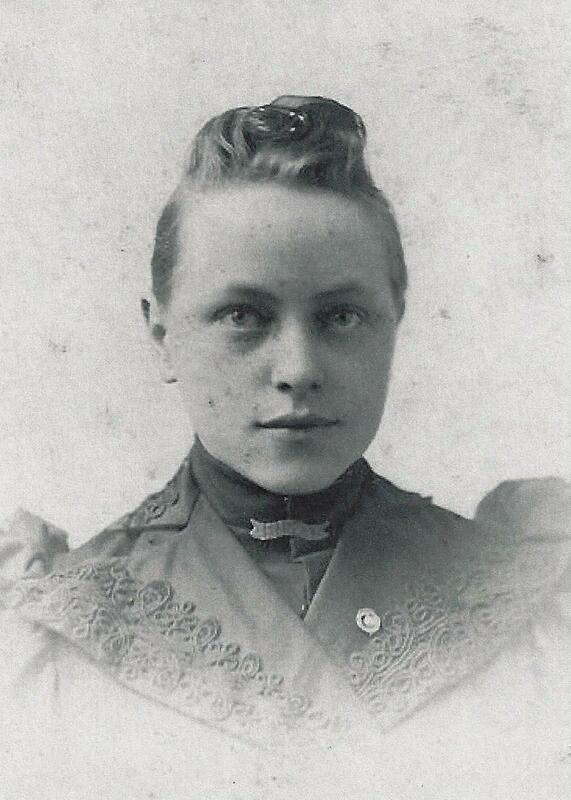 In 1898-1899 Lucy taught at West Sutton and Putnam Hill (traded places with Miss May M Larkin) earning $192 and $96 respectively and $5 for janitor’s service in June at West Sutton. In 1899-1901 Lucy is not listed as teacher. Jason Waters was teaching Vocal Education. 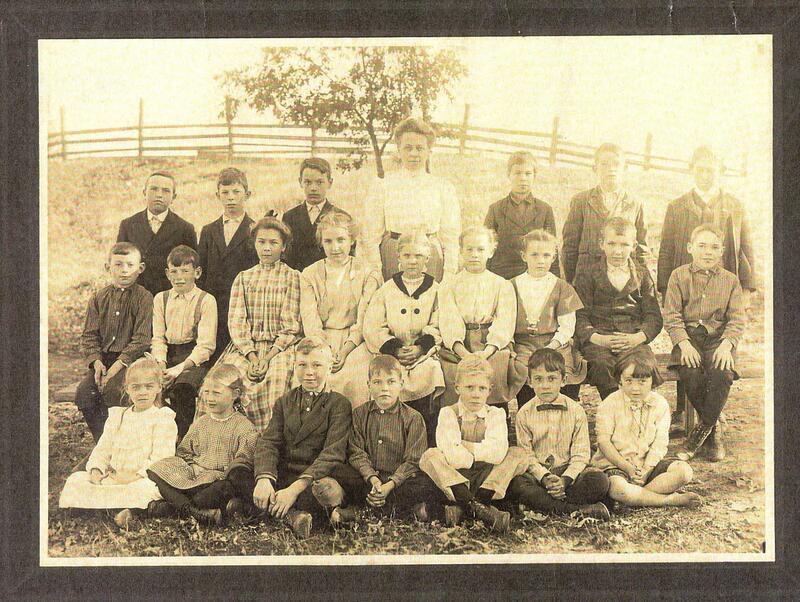 Undated class picture at West Sutton School. Phelps Family Archives. 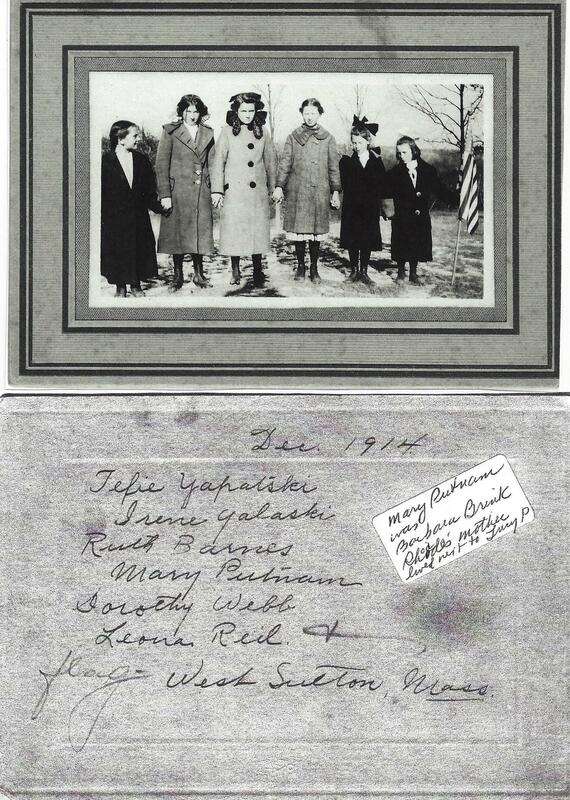 1914 December Ceremony, Phelps Family Archives. 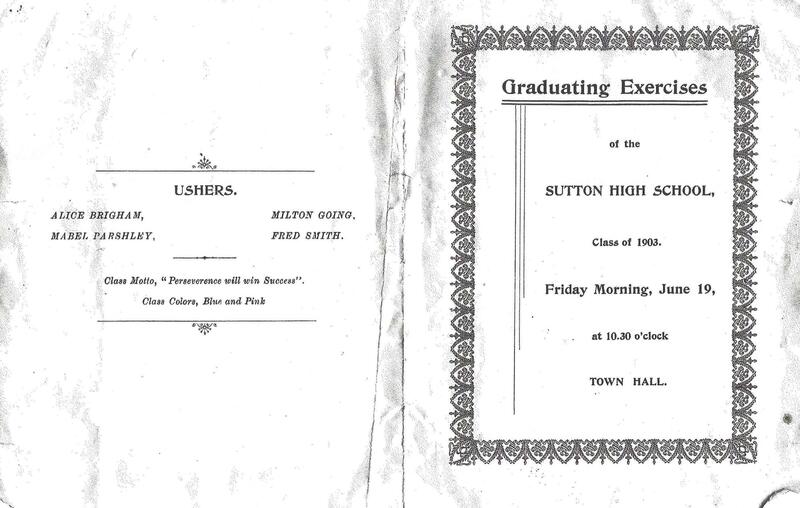 1927 West Sutton School, Phelps Family Archives. Undated class photo with Lucy at center rear. Phelps Family Archives. 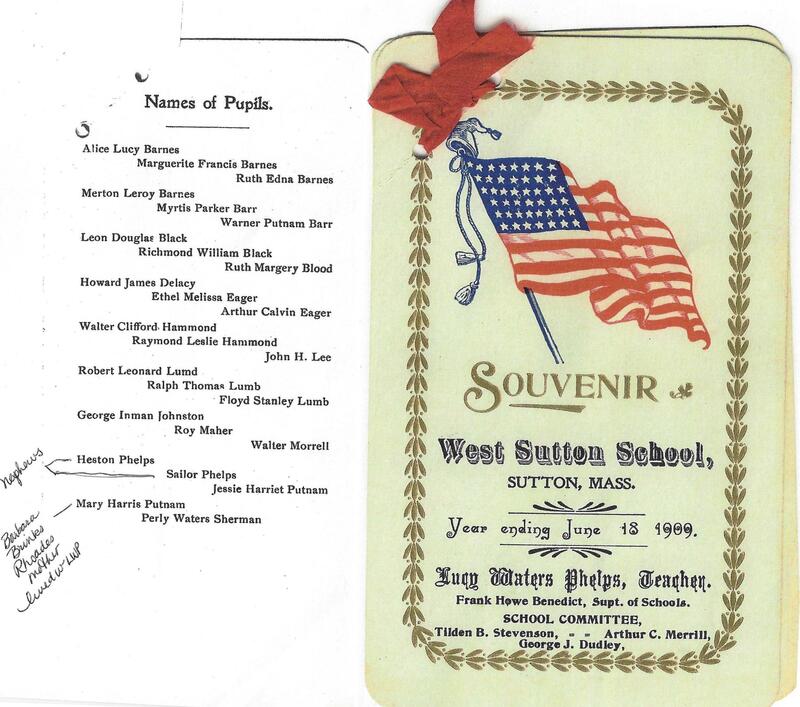 1906 West Sutton School. Phelps Family Archives. 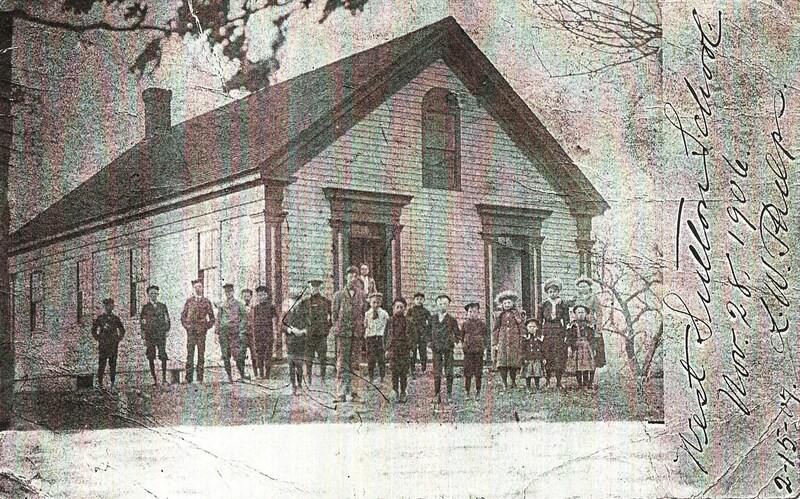 From 1899 to 1905 there is no mention of Lucy as a teacher in the school committee reports. 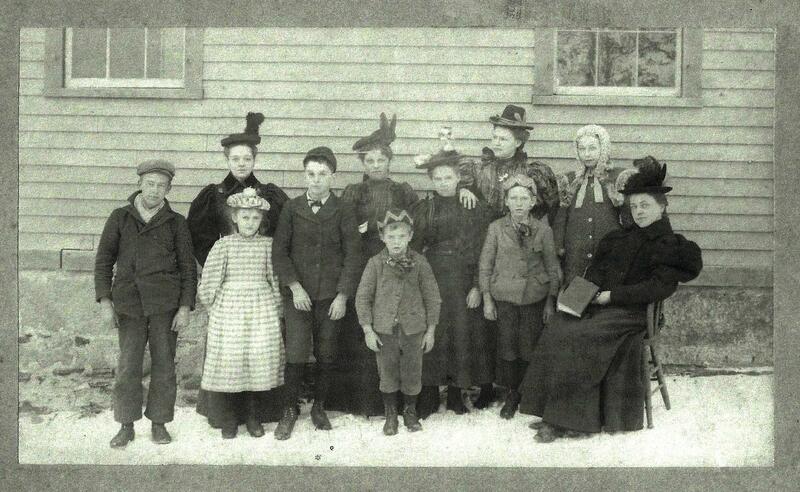 In the 1905-1906 report Lucy and eleven other new teachers are hired. “The cause lies in the geographical situation, the large school of all grades and low salary.” Auburn and Sutton Have had combined teachers’ meetings for several years. Lucy’s class had 28 registered (22 students between ages 7-14 and youngest age 5 and oldest age 15) with an average attendance of 21.8 for the 8 month 13.5 day school year. Lucy earned $288 in 1906-7 school year, $311 in 1907-8 , $324 in 1908-1909 and 1909-1910. The Superintendent’s Report for 1911-1912 cites a real problem obtaining teachers. 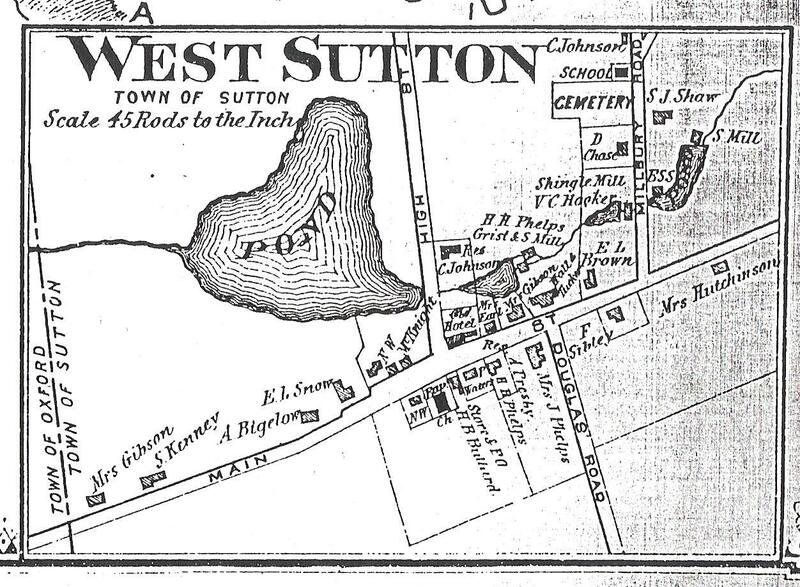 “The town is fortunate in having a number of resident teachers who are willing to remain because of home ties, for less remuneration that they could obtain elsewhere.” Lucy’s uncle Jason Waters dies in 1908 and West Sutton librarian position is open. Louise Sherwood replaces him for several years. Lucy’s salary fluctuates annually: !912-13 $333 with only 16 students, 1913-14 despite a supposed salary increase, Lucy earned $258 plus $13.50 for janitorial services for 27 weeks. In 1918 Lucy’s pay was raised to $550! 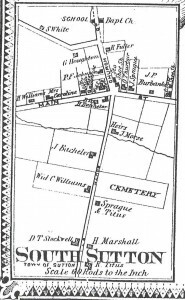 The earliest Sutton Report at the Worcester Public Library was The Annual Reports of the Town Officers of the Town of Sutton for the year ending Dec 21, 1921 (Millbury Journal Printers, Millbury, 1922). 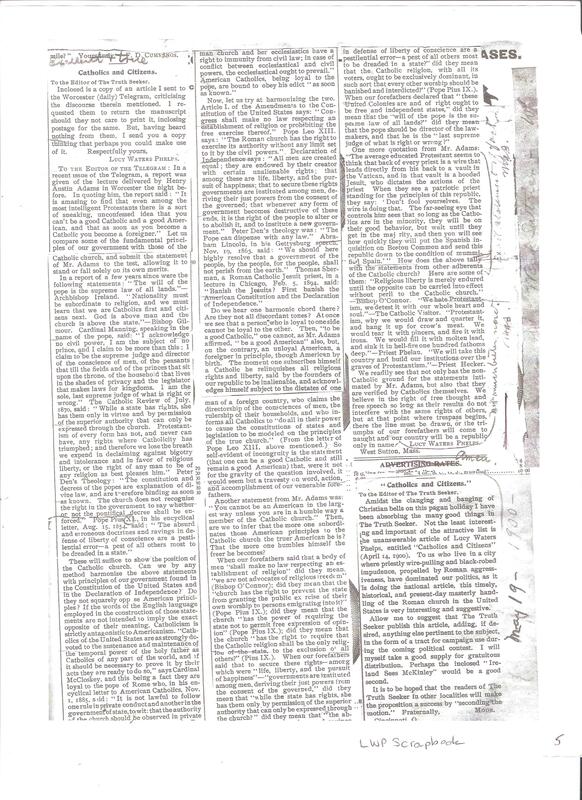 In the “Report of School Committee” (page 73) Lucy Waters Phelps was paid $450 and Mrs. Evelyn (Charles A.) Plummer was paid $300 in District 1, West Sutton School. 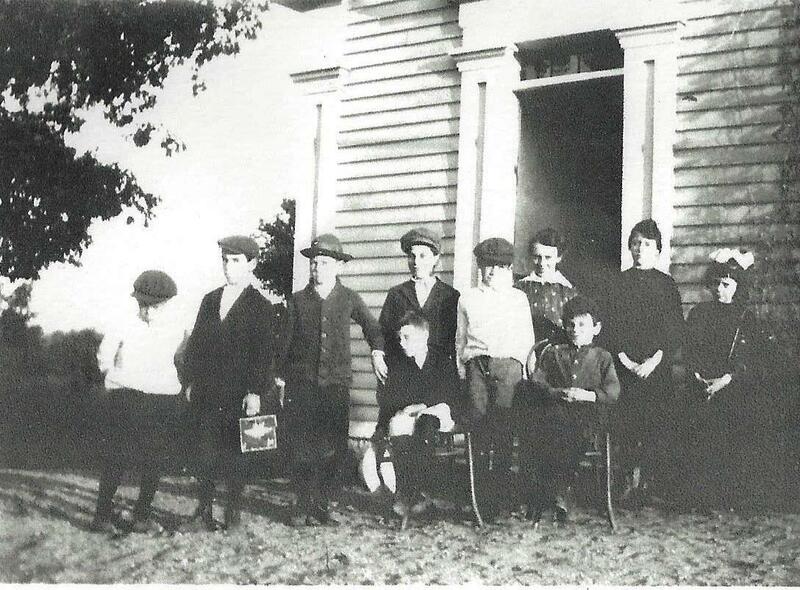 In 1920 there were 17 students and in 1921 there were 25 in grades 1-7. Phelps resigned as Librarian in West Sutton that September and Plummer took over. The Marble Fund was used for books and the Woman’s Education Association of MA sent about 40 books in their traveling library. 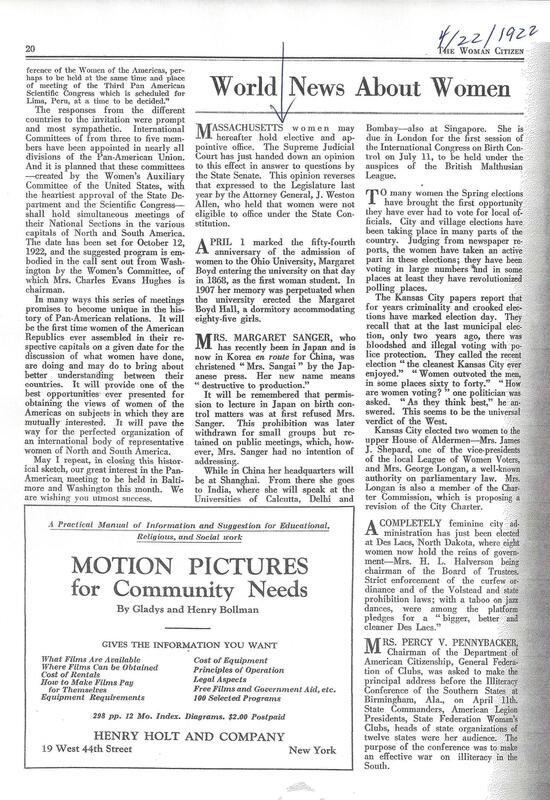 Phelps is not listed as a teacher in the 1922 Annual Report. Phelps began writing letters to the editor and then articles in The Truth Seeker, a journal begun in 1873 and now the world’s oldest Freethought publication. Its masthead read, Devoted to: science, morals, free thought, free discussions, liberalism, sexual equality, labor reform, progression, free education and whatever tends to elevate and emancipate the human race. Opposed to: priestcraft, ecclesiasticism, dogmas, creeds, false theology, superstition, bigotry, ignorance, monopolies, aristocracies, privileged classes, tyranny, oppression, and everything that degrades or burdens mankind mentally or physically. See Intellectual and Professional Development of Lucy Waters Phelps for her work with the American Press Writers Association. 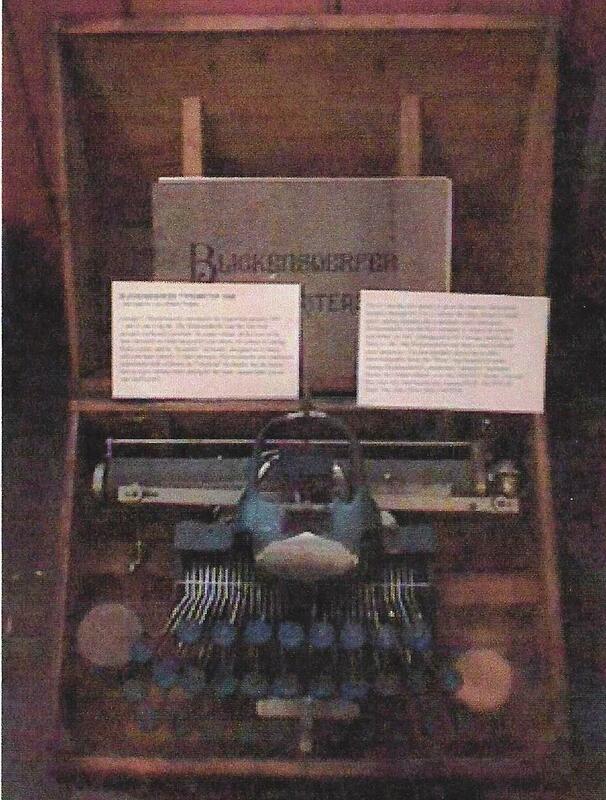 Photo from Stevenson Collection is an apt view of her 1887 and 1888 articles in The Truth Seeker. 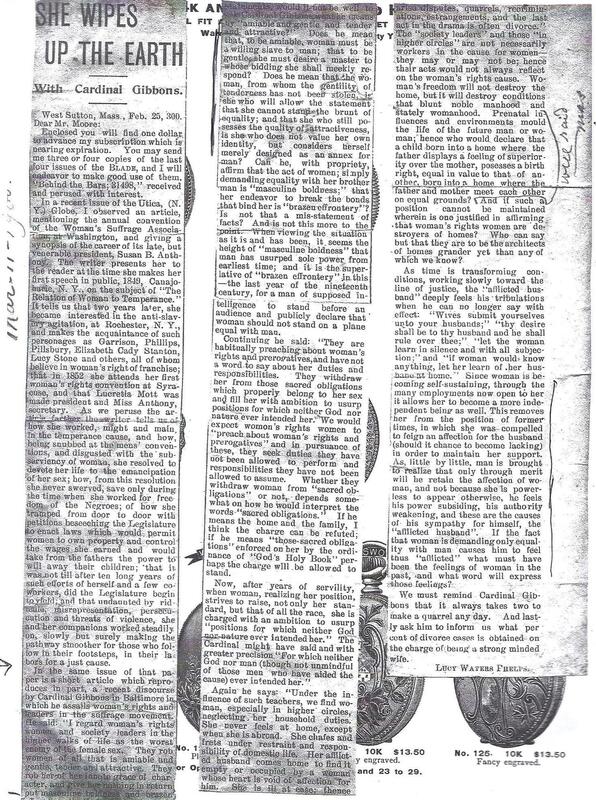 1892 The Truth Seeker articles by Lucy Waters Phelps from her scrapbook, Phelps Family Archives. 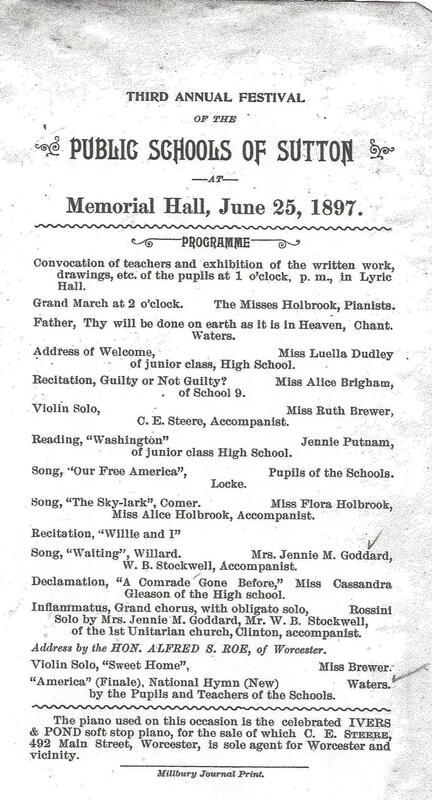 1894 Liberal Correspondence Club for Young People advertised in The Truth Seeker (Walter C. Clark, Benjamin Phillips, Edwin A. and M. Eloise Sailor, et. al.). Phelps Family Archives. 1898-9 The Blue Grass Blade and 1900 The Coming Nation articles by Lucy Waters Phelps from her scrapbook, Phelps Family Archives. 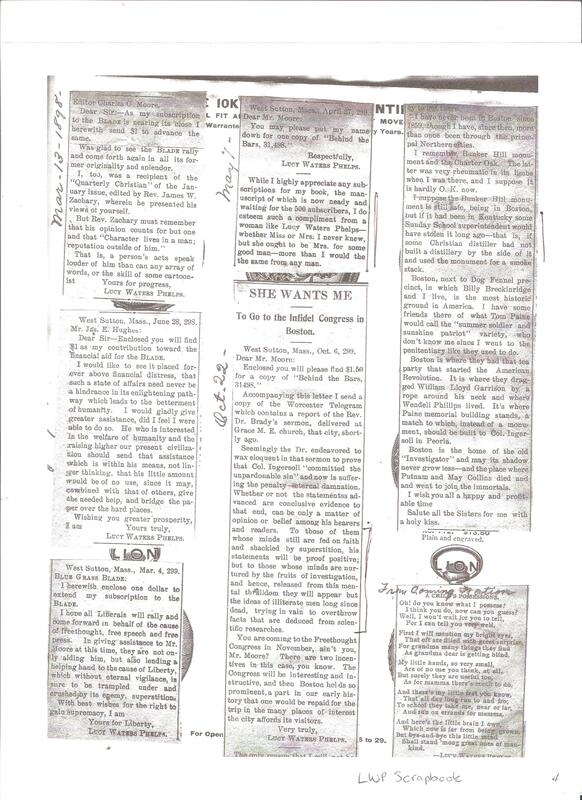 1900 The Truth Seeker articles by Lucy Waters Phelps from her scrapbook, Phelps Family Archives. 1900 March 11, “She Wipes Up the Earth with Cardinal Gibbons”, The Truth Seeker by Lucy Waters Phelps from her scrapbook, Phelps Family Archives. 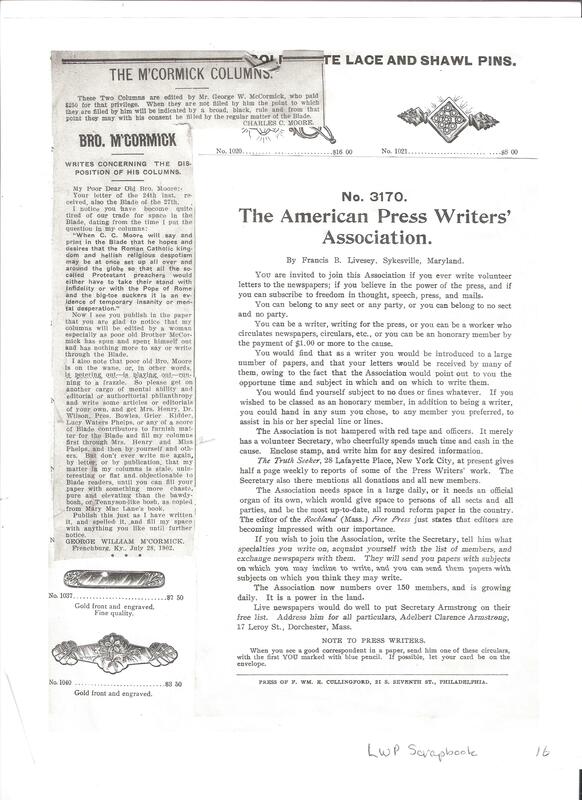 Invitation to American Press Writers Association [ca. 1901], Lucy Waters Phelps scrapbook, Phelps Family Archives. 1902 “The Woman’s Rights Department”, Our Home Rights, Lucy Waters Phelps scrapbook, Phelps Family Archives. 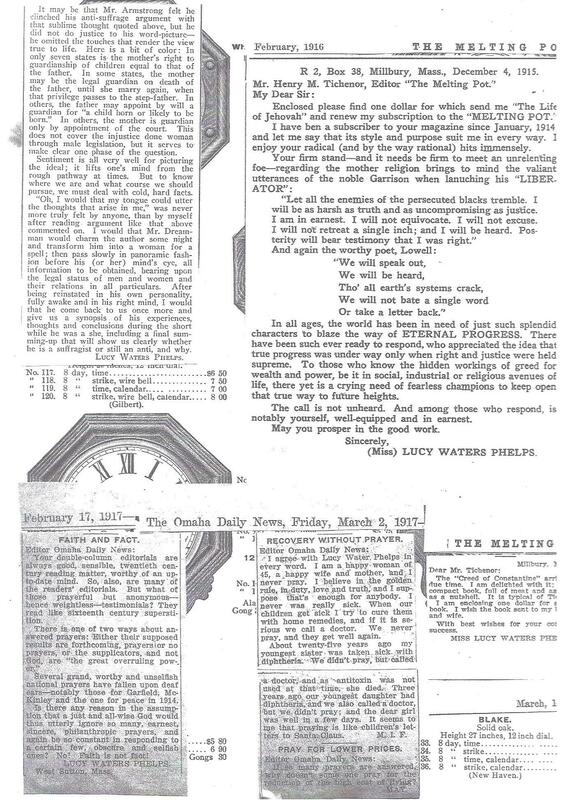 1915 The Melting Pot and 1917 The Omaha Daily News articles by Lucy Waters Phelps from her scrapbook. 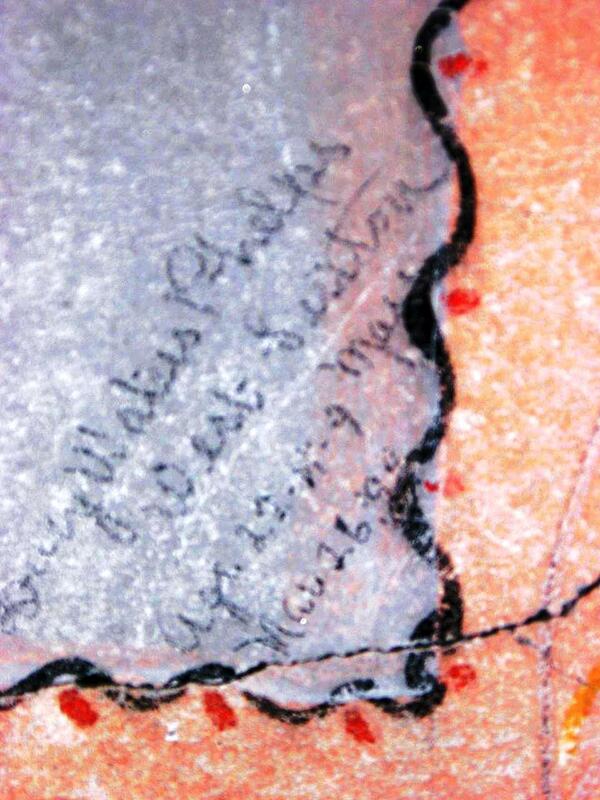 The scrapbook is an old catalog in the Phelps Family Archives. 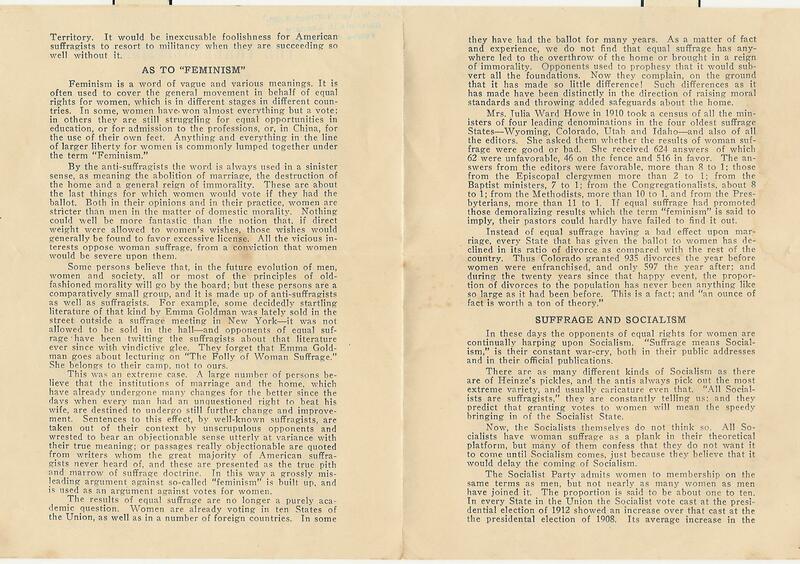 1915 July 24, “Department of Economics”, The Truth Seeker. 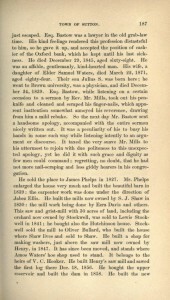 Lucy Waters Phelps scrapbook, Phelps Family Archives. already flaming here and there among the feminine element of the universe. 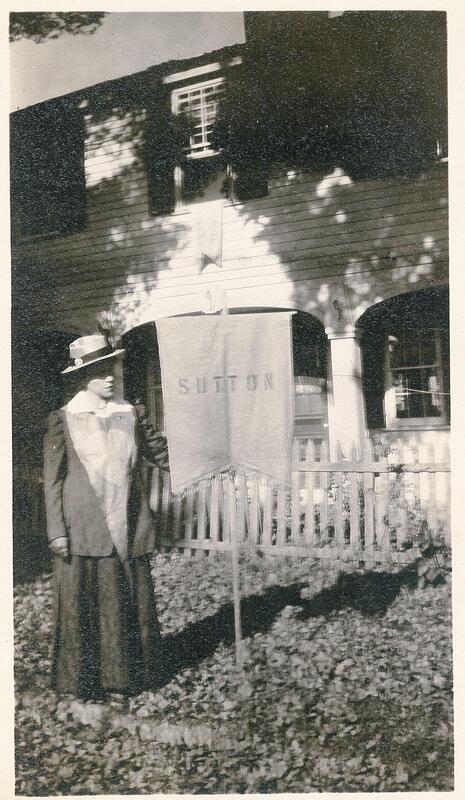 On left 1911 Lucy stands on Central Turnpike in front of her home in West Sutton, MA and on right she is ready to join the Worcester Suffrage Parade 30 Oct 1914 and/or the Boston Suffrage Parade 16 Oct 1915. From Phelps Family Archives. 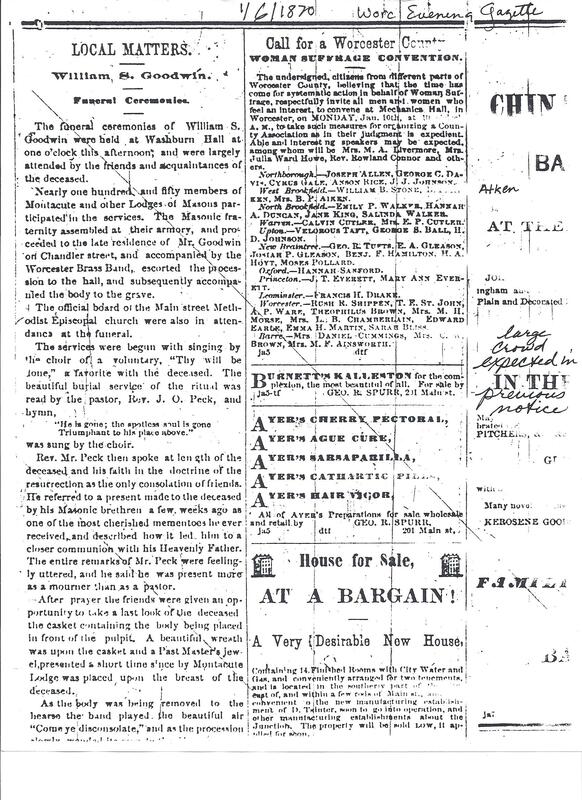 Many of the Worcester County Woman’s Righters who attended the 1850 first National Woman’s Rights Convention kept the cause alive and enlivened the next generation by calling for a Woman Suffrage Convention in the Worcester Evening Gazette on 6 January 1870. Lucy was greatly influenced by her Uncle Jason Waters, Esq. (9 October 1824-13 July 1908). He served in the state legislature from 1863-1864. Before Lucy’s birth, Jason subscribed to The Revolution in 1868, may have joined the National Woman’s Suffrage Association and corresponded with Susan B. Anthony. 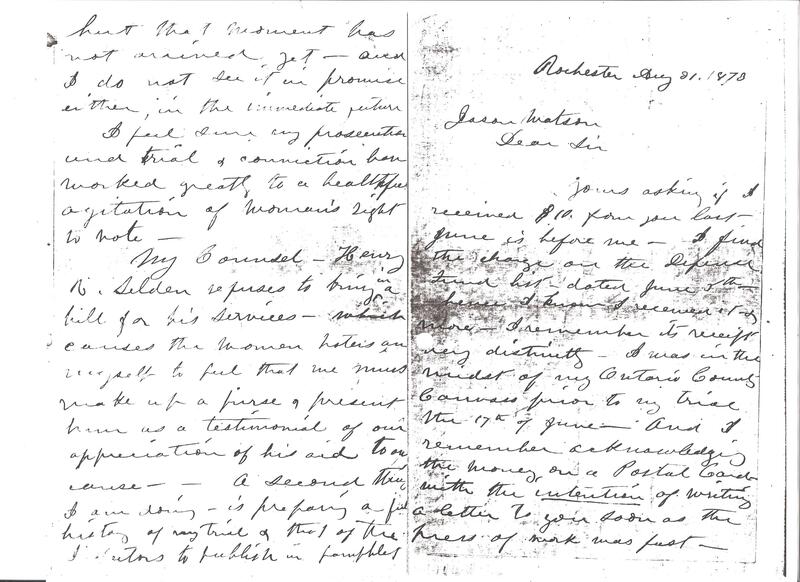 1870 Susan B. Anthony letter to Jason Waters. 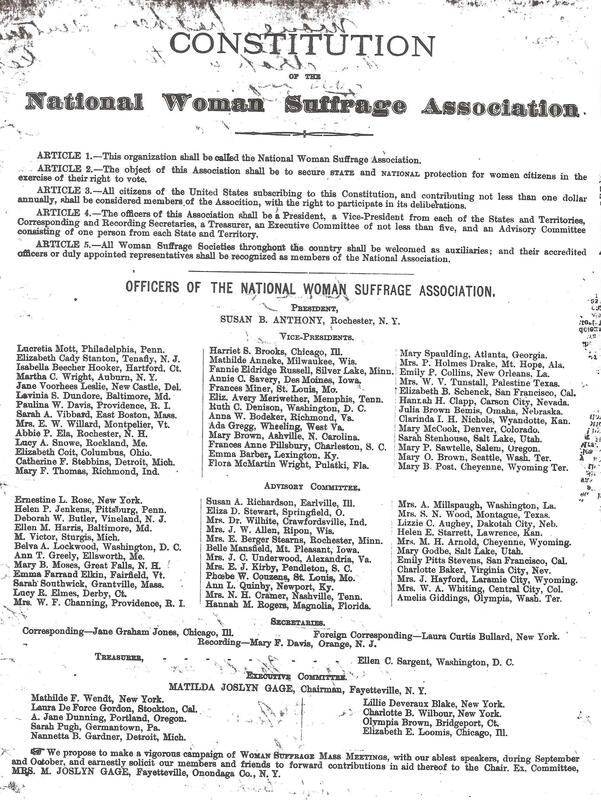 National Woman’s Suffrage Association. Phelps Family Archives. 1873 Susan B. Anthony Letter to Jason Waters. National Woman’s Suffrage Association. Phelps Family Archives. 1874 Susan B. Anthony Letter to Jason Waters. National Woman’s Suffrage Association. Phelps Family Archives. 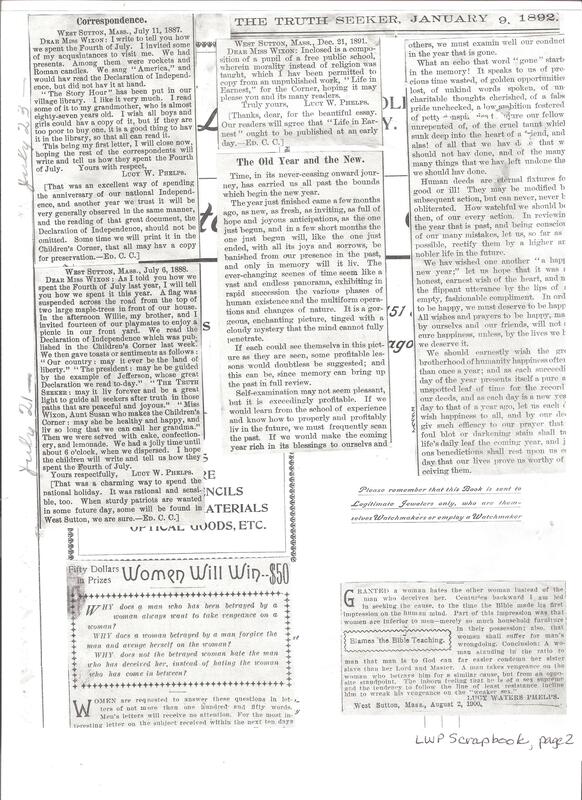 The following excerpt summarizes Lucy as a suffragist is from pages 8-10 of Rebecca Rhoades’ “Lucy Waters Phelps: Profile of a Turn of the Century Woman” submitted for a college course on May 2, 1979. 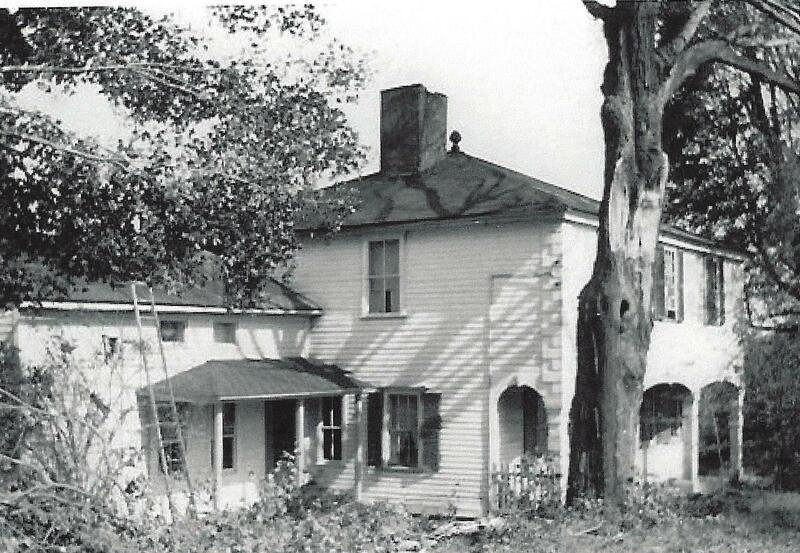 Rebecca’s mother Barbara Brinks Rhoades owns the Phelps Family Archives. Barbara’s mother is shown below with with Lucy’s mother. 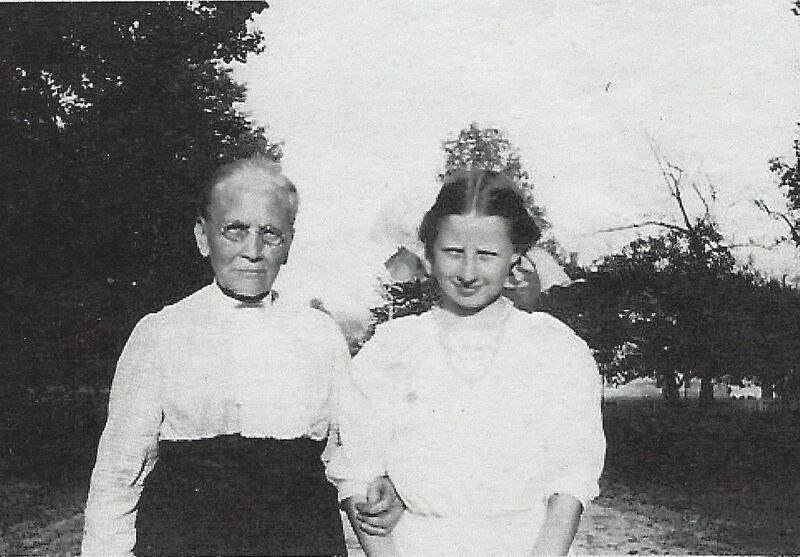 Julia Matilda Waters Phelps, aged 74, with Mary Harris Putnam October 1915, Phelps Family Archives. Camilla Whitcomb’s obituary is in this folder (1860-1949) as a champion of women’s rights in Worcester. 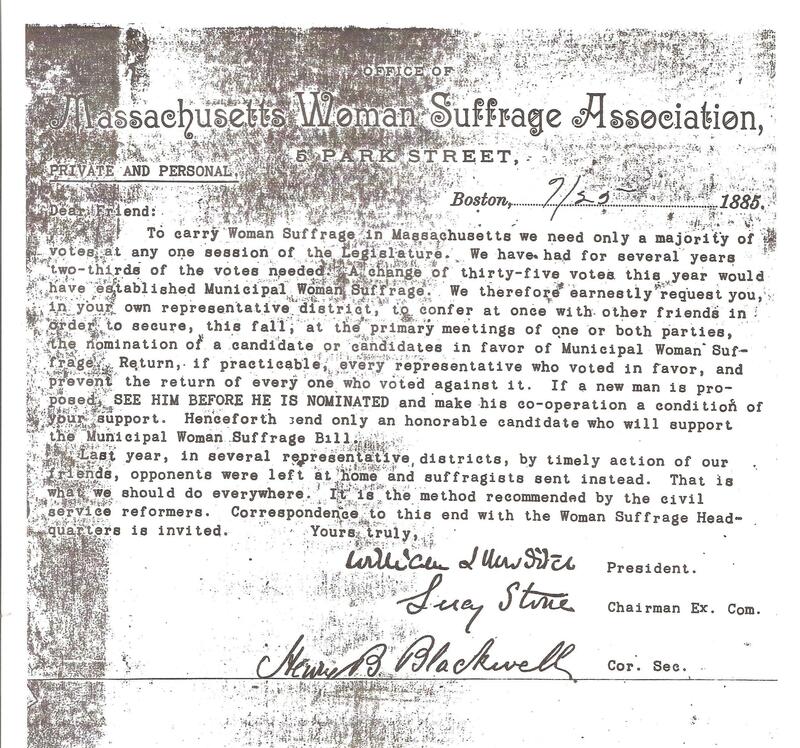 1885 Massachusetts Woman Suffrage Association letter to Lucy Waters Phelps. Phelps Family Archives. 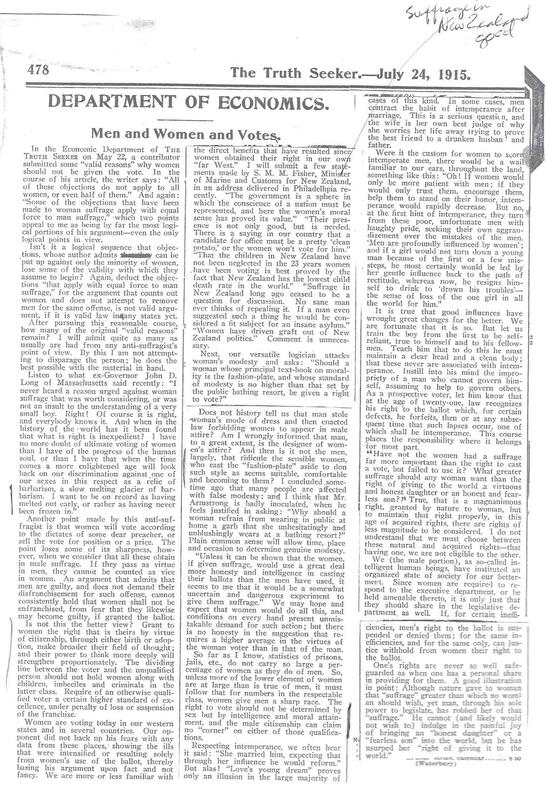 1898 Women of Sutton Register to VOTE. The General Register of Voters, Vol. 2. at Sutton Town Hall, Sutton, MA. 1915 Honoring Lucy Stone Pilgrimage. Massachusetts Woman Suffrage Association. Phelps Family Archives. 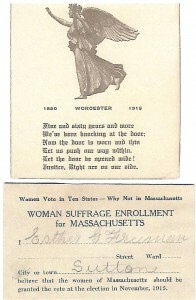 Bernette E. Bachelor Obituary, Woman’s Suffrage Folder in Pamphlet File Worcester Historical Museum. Grenfell, Helen. “The Ballot and the Schools” [ca. 1913]. 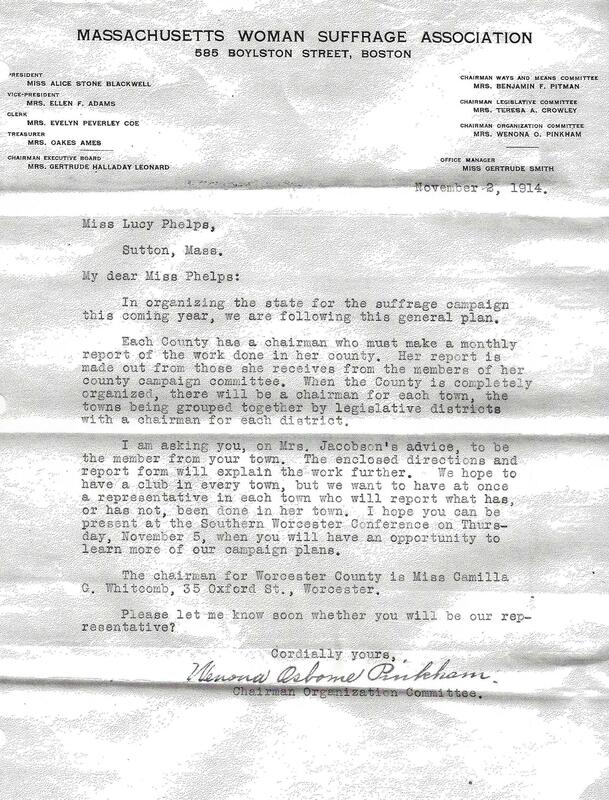 Massachusetts Woman Suffrage Association, Phelps Family Archives. Sarah H. Henshaw Obituary, Woman’s Suffrage Folder in Pamphlet File Worcester Historical Museum. Hopkins, Mary Alden. “Woman’s Place” [n.d.]. 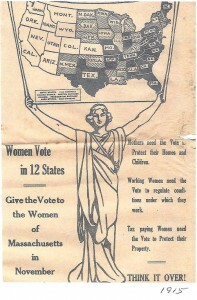 Massachusetts Woman Suffrage Association. Phelps Family Archives. 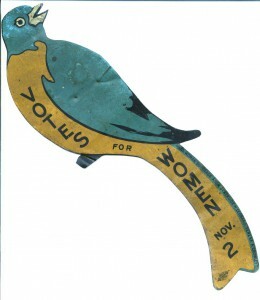 Marot, E. F. “Two Suffrage Songs”, 1913 (sold for a nickle). Phelps Family Archives. 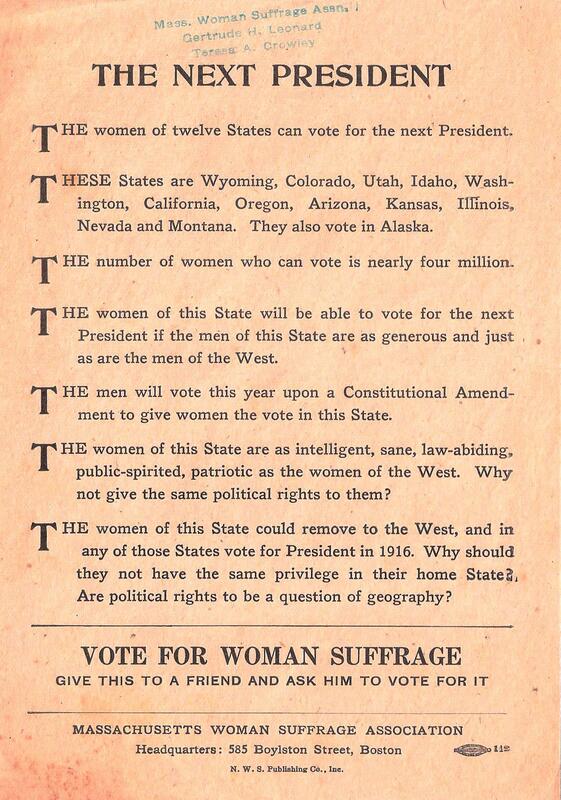 National Woman Suffrage Association [n.d.], Phelps Family Archives. “R. H. J. Makes Plea for Ballot”. The Worcester Telegram [n.d.]. Phelps Family Archives. Stone Blackwell, Alice. “Some Massachusetts Laws” [n.d.]. Women’s Journal. Phelps Family Archives. 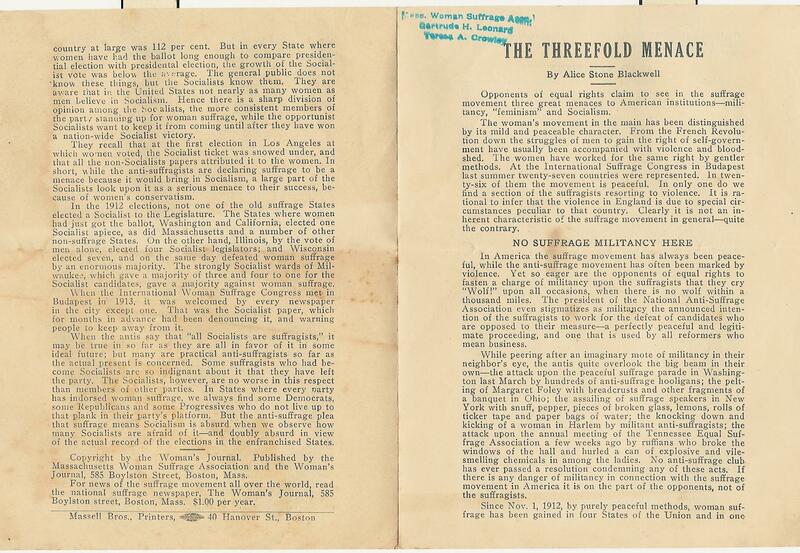 Stone Blackwell, Alice.“The Threefold Menace”l [n.d.] page 1; page 2. 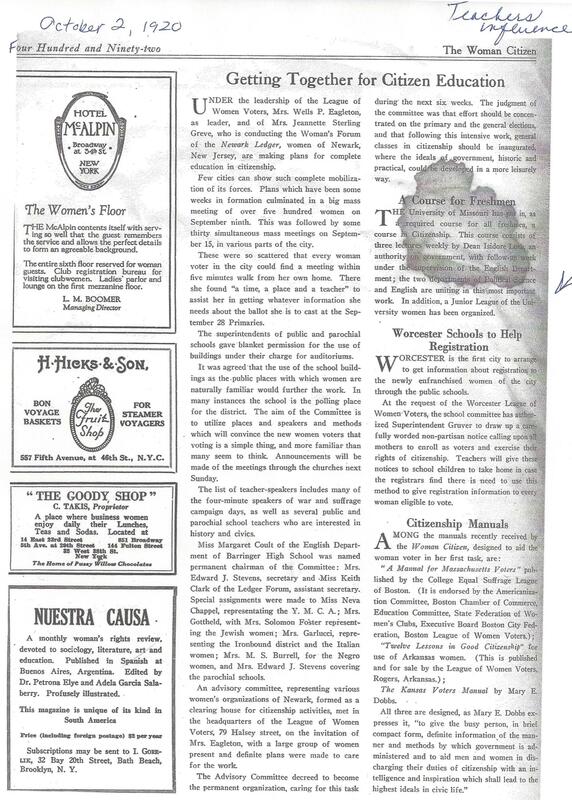 Women’s Journal. Phelps Family Archives. “‘Suffragette City‘: Winning the Vote for Women in Worcester”. 2004 Fall WWHP Newsletter (3). “The Test of Experiment” pamphlet. 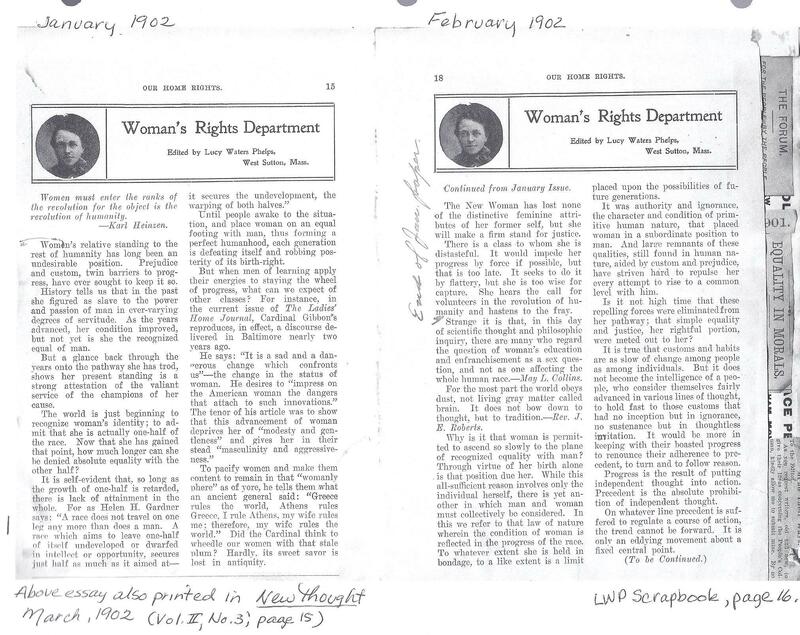 MWSA and Woman’s Journal. Phelps Family Archives. 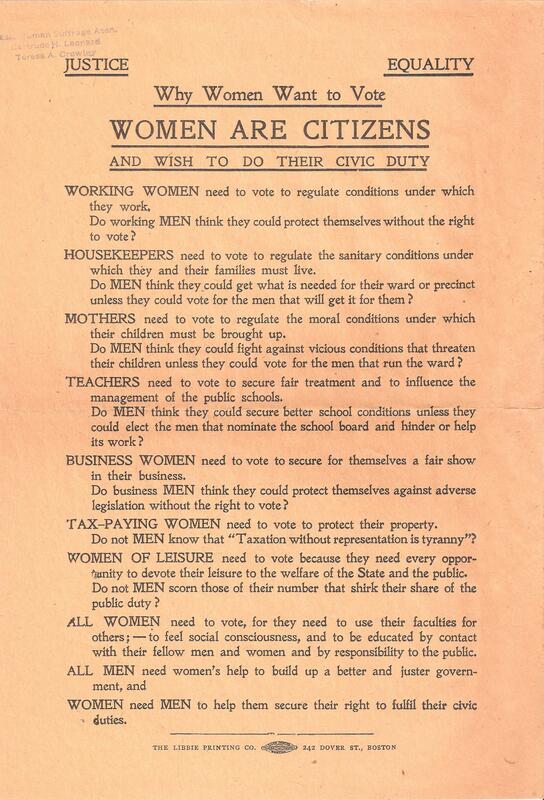 The Woman Citizen excerpts: 1917 April 11; 1920 October 2; 1922 April 22. Phelps Family Archives. The Woman Citizen, came into existence as a result of a substantial bequest from Mrs. Frank Leslie to Carrie Chapman Catt, the head of the National American Woman Suffrage Association. According to the terms of the bequest, the money was to be used to further the cause of woman suffrage. 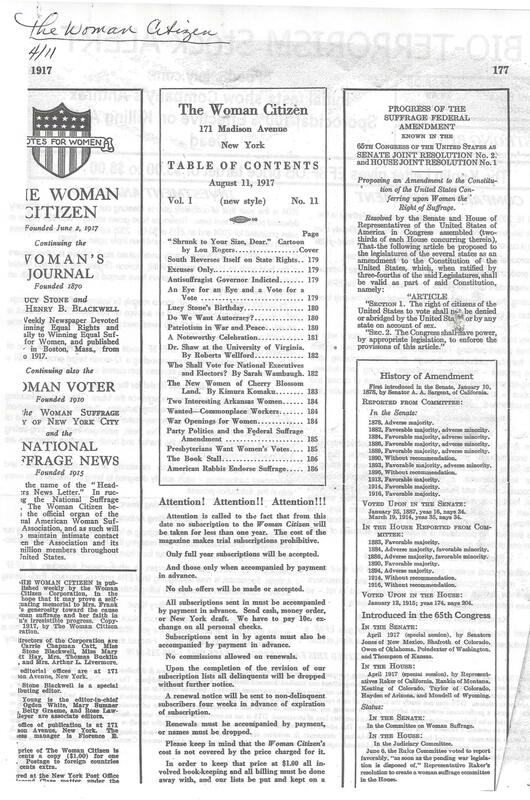 Accordingly, Catt founded The Woman Citizen in 1917 by merging three suffrage journals, the Woman’s Journal, the National Suffrage News, and Woman Voter. Every congressman was added to the mailing list free of charge. Worcester Suffrage League (a.k.a. 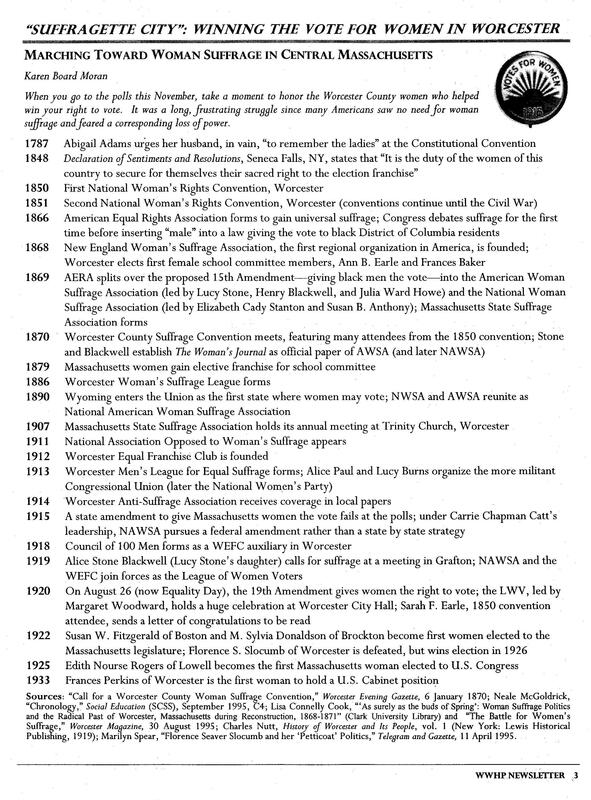 Woman Suffrage Club, Worcester Woman Suffrage League, Equal Franchise Club) listings in Worcester City Directories,1887-1915. 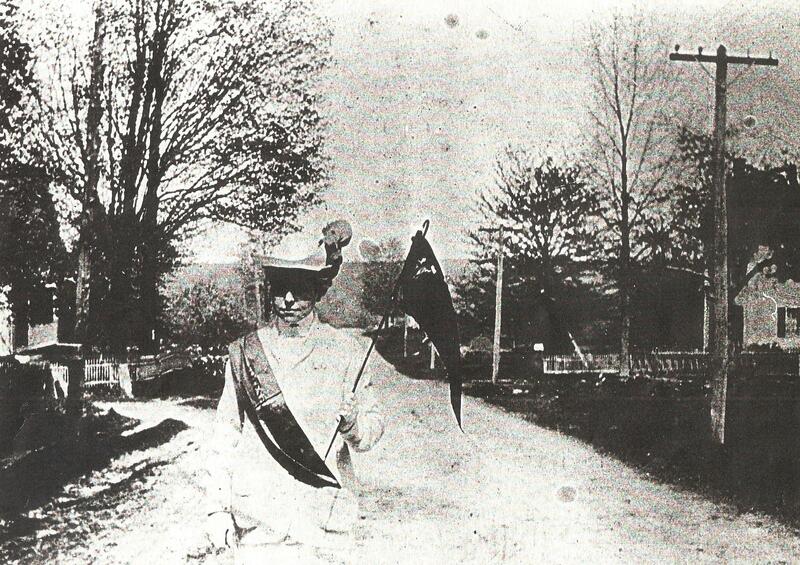 Worcester Suffrage Organizations in Charles Nutt’s History of Worcester and its People, Vol. I. New York City: Lewis Historical Publishing Company, 1919 (499-503) eBook. 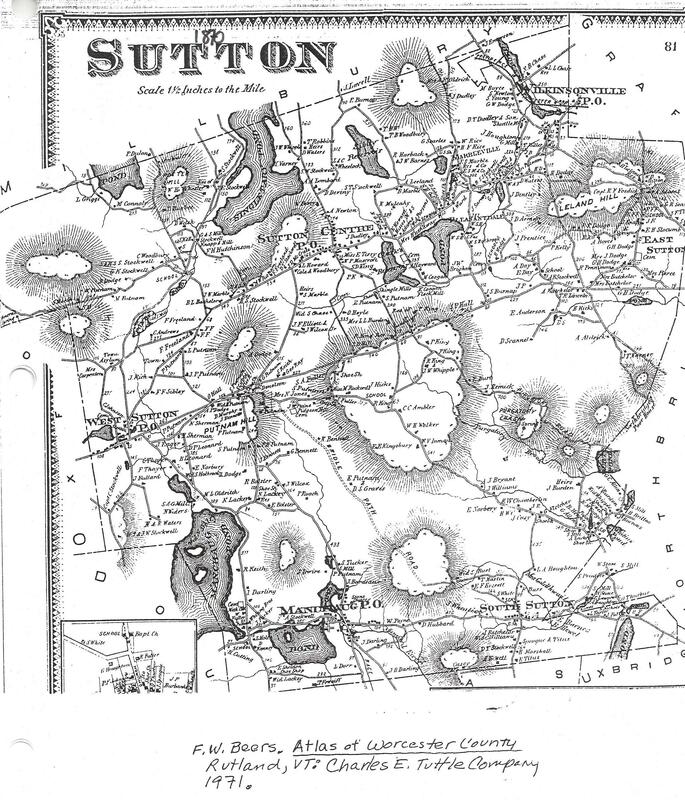 This image links to the original version of the History of the Town of Sutton, Massachusetts printed in 1878. It has been reprinted in 1966 and 1970 with additions by Lucy Waters Phelps.